After years of steady decline, startup and venture capital activity is firing on all cylinders again. 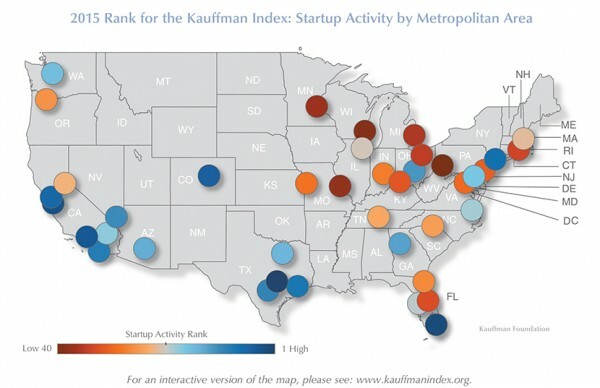 According to the Kauffman Foundation, startup activity increased in 32 of 50 states last year and 18 of the nation’s top 40 metropolitan areas also saw increases in new venture activity. Venture capital surged in tandem with startups; with US$86.7b funded through 6,507 deals, the year hit the highest annual investment mark in the last 13 years. 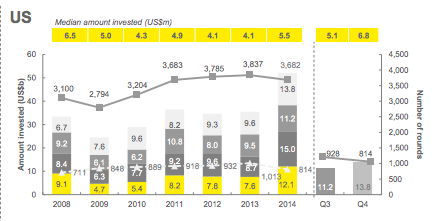 Investment activity was particularly strong in the second and fourth quarters of 2014, with both quarters recording over US$20b funding and each with over 1,500 deals for the quarter. Several regions in particular stood out. Perennial startup incubators Silicon Valley and San Francisco not only maintained their lead for the umpteenth year in a row, but almost doubled the amount invested from 2013 to 2014. This increase was driven by large deals from mobile-based platforms including Snapchat, Uber, Instacart, and Flipkart.com. The tendrils of venture capital are infiltrating other major markets as well, and the residual effect is now being felt across the legal market. Not only are emerging companies practices growing and getting busier, associates are also seeing expanded opportunities to transition in-house, all of which has led to a resurgence in mid-level associate opportunities in these practices across the U.S., including regions such as Silicon Beach, which posted 8 new Bigaw EC/VC openings in the past two quarters, Boston (20), Austin (6), and even the Research Triangle (3). Nonetheless, the Bay area is still the epicenter of venture capital, with over 50 positions created since the start of the year. Each of the leading indigenous Silicon Valley firms (Orrick, Wilson, Cooley, Fenwick) are interviewing for their emerging companies and venture capital practices — though class year and experience requirements vary by firm. Additionally, mid-market and upper-tier firms are expanding their reach in these practices in the Bay Area. Goodwin Procter, for instance, has been particularly successful in this space catering to a wide range of early to mid-stage clients, including companies like Zendesk and Xoom, many of whom were secured early in their lifecycle from the firm’s strong private funds practice. Firms like Goodwin also provide a compelling business unit structure for candidates looking to specialize their skill set under the umbrella of a broader technolog-focused group. Because venture capital and emerging company associates are still scarce relative to demand, we’re also seeing a number of these firms loosen their requirements for these lateral positions. Several of our clients, for instance, have been interviewing with our in-house candidates looking to explore a return to private practice. In addition, some clients have begun to express a willingness to retool corporate associates from other disciplines into this practice. I recently sat down with the head of one of the more prominent EC/VC groups in the Bay Area. He echoed this sentiment, but also stressed that candidates will need to demonstrate business acumen that is not often cultivated in other public company practices. For example, fee sensitivity and a willingness to engage with clients on billing justification. The market for emerging company and venture capital associates will be robust across the U.S. over the next year, but to maximize their opportunities and platform, associates in these fields should consider relocating to the Bay Area.